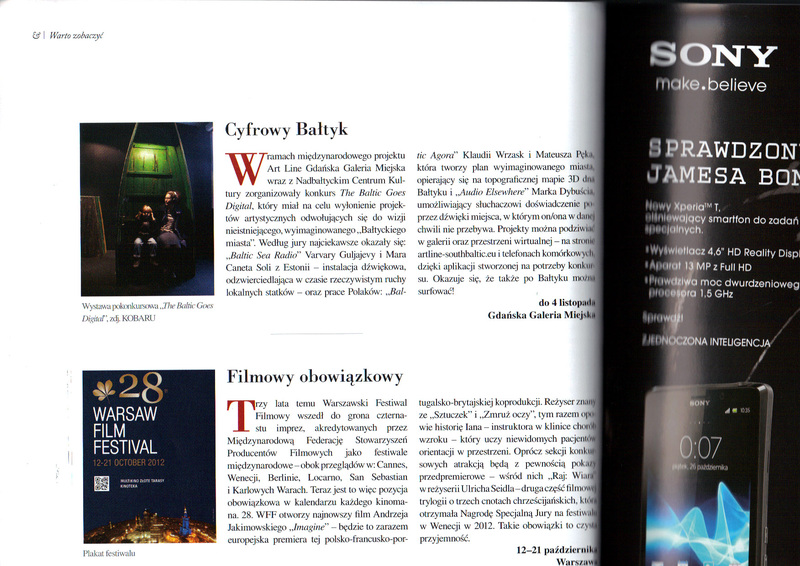 An article by Juhan Soomets about our exhibition “Kameeleon” in Sirp. 25th January 2019, age 17. Our artwork DataShop in “Plurality Of Digital Practices” an article by Dominique Moulon in Art in the Digital Age. Varvara Guljajeva, PhD thesis “From interaction to post-participation: the disappearing role of the active participant“, Estonian Academy of Arts (2018). Our artwork DataShop in “Data Shop, ermetic data can” an article by Chiara Ciociola in Neural magazine. Our artwork DataShop at the Digital Design Weekend in “El arte digital español conquista Londres” (Spanish digital art conquers London) an article by Roberta Bosco y Stefano Caldana in Aquae Blog. Our knitted works in “Tejiendo pixeles”(Knitting pixels) an article by Gisela Chillida in La Maleta, Humanities and Economy Magazine, vol 30, july-aug 2018. Few words and images on Sunday Painter in article “A summer agro-tech mentality at Maajaam” by Marika Agu and Francisco Martinez in KUNST.EE, 2018/, p. 53-57. Our work appeared in ARTEFUSE. An article by Séverine Vanina. VHMOR blog writes about some of our works. An article by The Nomad Creative Projects. Experimenta Magazine writes about Circular Knitic. An article by Chiara Giordano. Our exhibition “Camaleó” appeared in Uncovering CTRL. An interesting article about the artworks that we had shown. Interview in Núvol, digital de cultura by Megan Descayre. 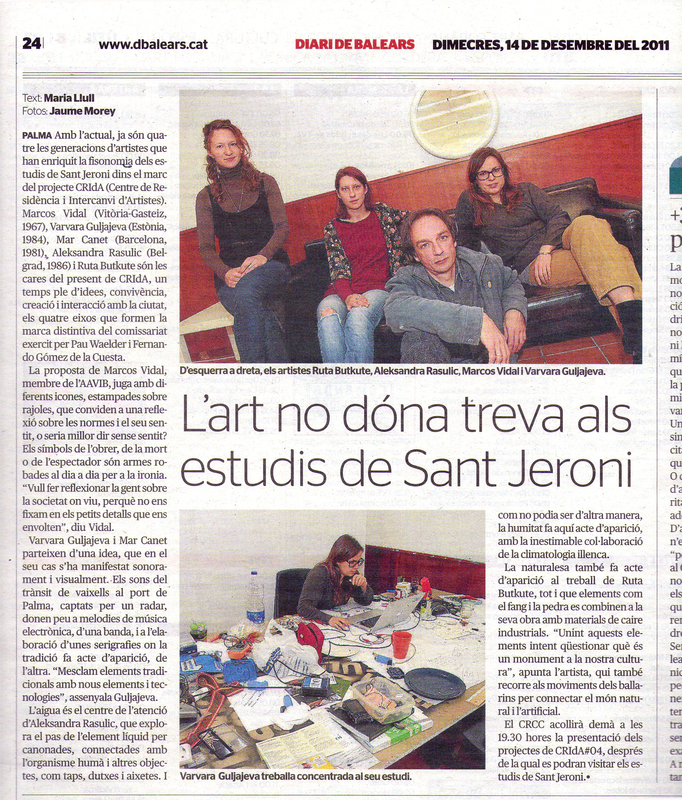 Interview in El Diari de Girona by Albert Soler. El País talks about our latest exhibitions in Catalonia in the article ”Los patrimonios inmateriales de la época digital” (The intangible heritage of the digital era) by Roberta Bosco. Blekinge Läns Tidning, a newspaper in Sweden, writes about our residency work at A.I.R. Blekinge Baltic One. El Pais mentions our work in the article ”Dame datos (y tecnología) y haré arte” (Give me data and I will make art) by Isabel Valdes. Merle Luhaäär discusses PERRO group exhibition, which was organized by us and where we also participated as artists, in SIRP. SPAMpoetry is on the cover of culture magazine Vikerkaar December’s number. Also dedicated article about our practice inside by Raivo Kelomees. Stacey Koosel interviewed us. Here is the article in SIRP. Are Today’s Politicians Reptiles? Well, Politics Are Chameleonic by Andrew Salomone in Creators Project. Interview in Echo Gone Wrong by Merle Luhaäär. Progetto grafico, Open Technologies. International graphic design magazine, nº30. Editor in chief: Silvia Sfigliotti. Published by Aiap, 2016. Project: NeuroKnitting. page:74-76. Article about our practice A Place Called Home by Pau Waelder in Estonian Art 1/2016 (37) magazine, page 37-39. We got mentioned in a nice article On media art in Estonia and the Baltics: digital technology as cultural constant written by Raivo Kelomees in echo gone wrong online magazine about art in Baltics. KLANGHYPOTHESEN, Material, Forschung, Kunst. Edited by Subnet, 2015. Project: NeuroKnitting. pp:19-21. Crafting our Digital Futures, part of V&A Digital Design Weekend. Suported by Arts and Humanities Research Council. Edited by Irini Papadimitriou, Andrew Prescott and Jon Rogers. Published by Uniform Communications Ltd.,2015. Project: Circular Knittic. pp:48-49. Paloma G. Díaz‘s article discussing our work in El Asombrario. Digital Revolution. An inmersive exhibition of art, design, film, music and videogames. Edited by: Neil McConnon, Conrad Bodman and Dani Admiss. Published by Barbican International Enterprises, 2014. Project: Wishing Wall. pp:186-187. Canet, M and Guljajeva, V ”NeuroKnitting” in RHIZOPE – Art & Science – Hybrid Art and Interdisciplinary Research. Editors: Piibe Pirma, Veronika Valk. Published by Estonian Academy of Arts, 2014. Projects: NeuroKnitting, The Rhythm of City. pp:84-87; 128-129. Italian newspaper La Repubblica writes about us. Deutche Welle explores the idea behind SPAMpoetry work. Interview in Craftivism: The Art of Craft and Activism. Edited by Betsy Greer, July 2014. Projects: SPAMpoetry, Kombi, Neuroknitting. pp:69-75. Homespan magazine from Australia writes about our NeuroKnitting project. Wired magazine mentions NeuroKnitting project. Waelder, P ”Baltic Sea Radio: on data fows and life in real-time” in Art Line – A Baltic collaboration. Editors: Magdalena Mróz-Grygierowska, Torun Ekstrand. Published by Blekinge museum, 2014, page:178-181. Canet, M and Guljajeva, V ”The Revolution of Soft Digital Fabrication” in Social Fabric (strategic Creativity Series). Editor: Michelle Baggerman. Published by Design Academy Eindhoven, 2013, page 46-50. Häkeln + Stricken für Geeks. Autor: Verena Kuni. Published by O’Reilly, September 2013. Projects: NeuroKnitting, SPAMpoetry. page:288-290. Roberta Bosco y Stefano Caldana write about mine and Mar Canet’s work on stitches and pixels in El Pais.